The first two legs of our three leg journey home had been rather … eventful*. So when our Singapore Airlines flight was nearing the end of its descent into Perth, I breathed a huge sigh of relief. Finally we were home and I’d be seeing my kids soon. Then, as if to truly make us feel ‘at home’ the plane started being buffeted around. Good old Perth. Always with the hairy landings thanks to the strong winds that come off the scarp. Then things started getting really bumpy. Was I just being over-sensitive, or was our very large plane being thrown around a bit more than was normal? We got our answer not long after. 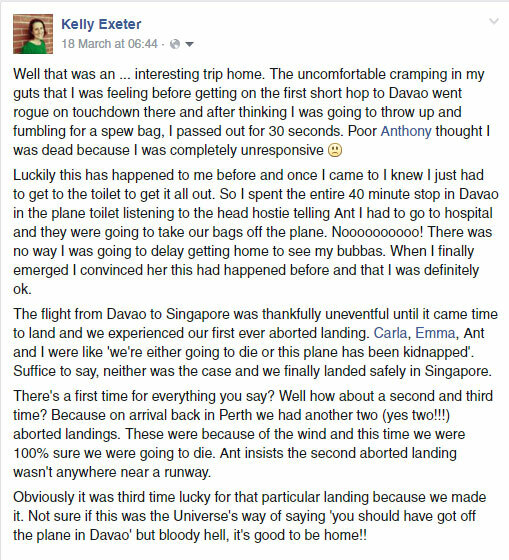 Having experienced my first ever aborted landing when we flew into Singapore only 10 hours earlier, I wasn’t keen to experience another. Which was too bad really because there was the delightful sound of the engines screaming as our plane pulled out of the landing and went into steep ascent. Ant and I looked at each other, bemused but not alarmed. In contrast to the aborted landing into Singapore for which there was no obvious reason (and none given), it was pretty clear the wind was to blame here. The pilot went round for another go. The wind wasn’t going anywhere and Perth’s runways only go in one direction. So there was no real capacity to change things up. And I had zero confidence that the pilot who’d twice failed to land the plane thus far was going to be able to do it on a third try. What went through my mind at this point? Well Ant probably won’t thank me for this, but I was glad we were going to die together. I’m not sure why I took such comfort from the thought given it would have been better for our kids if one person survived. But I did! The next thing to cross my mind was that we really should have updated our will. We made it years ago before we actually had any kids and had decreed that my sister Robyn should be the one to raise our kids. Robyn has three kids of her own now … I’m not sure she’d want to be a mother of five! The final thing to cross my mind was … nothing. Instead, this incredible feeling of peace and calm settled over me. I’ve thought a lot about that feeling since. And the best explanation I can come up with was that, for the first time in a long time, I had zero control over a ‘situation’. There was literally nothing I could do to affect the outcome. So I gave myself completely over to the moment and just … relaxed. It was liberating and exhilarating. Like nothing I have ever felt before. Is this what true mindfulness feels like? Is this why people meditate? Is this the payoff when you get meditation ‘right’? Whatever it is – I’d love to achieve that sense of peace again. 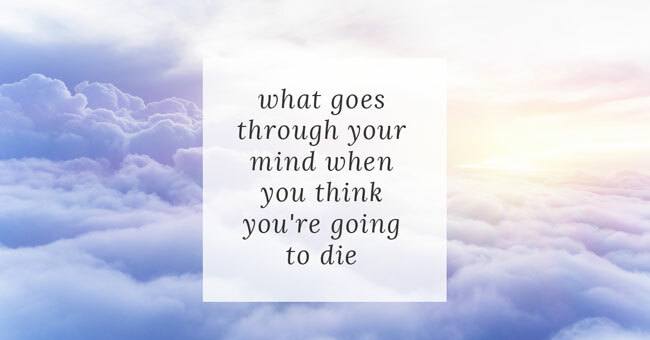 But without the whole ‘thinking I’m going to die’ bit. So fill me in folks. Have you ever experienced that kind of calm? What led you to it? *As you can tell, we landed safely in the end. Third time lucky. What made the rest of the trip home so eventful? Read about it here.